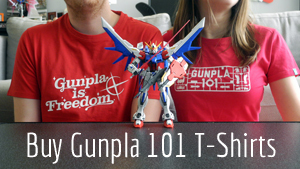 Step Up Your Gunpla is a new series of tutorials that Gunpla 101 contributor Milky has designed for builders who want to bring more pizazz to their kits. Have you ever wondered why different types of paint lead to different results? Why, even if you have two paints that claim to be “bright red,” one will show up thickly on your Gunpla, and the other will be thin and streaky? It’s all in the chemistry. I’m here today to give you an inside scoop on the different types you can use for Gunpla, and what works and what doesn’t when combining paints. This is a plastic polymer paint that is the most common of all paint types. It dries in about 20 minutes, and cures in about 24 hours. It is “water-based,” meaning it can be thinned with water. For airbrushing, I use an alcohol-based thinner that is lighter and dries faster than water. Example acrylic paint brands: Tamiya, Citadel, Vallejo. This is a paint that usually dries to a hard, glossy finish. It takes 2-3 hours to dry, with a 24-48 hour curing time. Unlike acrylic paint, which can be thinned with water, you need to use paint thinner to be thin enamel properly. Enamel is special also in that a turpenoid-based lighter fluid—like Zippo lighter fluid—can be used to thin it out for use with panel lines and clean up. However, you can’t use lighter fluid to thin it for airbrushing. Example enamel paint brands: Testors, Humbrol, Gundam Markers. Several kinds of lacquer paint. This is the most highly pigmented paint there is, as well as the type with the strongest-smelling fumes—especially when it is paired with an airbrush, as it often is. It takes about 20 minutes to dry, but requires a special kind of paint thinner aptly named lacquer thinner to make it even. Lacquer thinner is dangerous and should be used only in controlled areas with proper breathing precautions taken. Always wear a dust mask or a respirator when using this type of paint. Example lacquer brands: Mr. Color, Alclad II, Testors. This is a very slow drying paint. As a result, mineral spirits are usually used to thin oil paints to make them dry a little more quickly. Oil paints are useful for creating weathered washes and effects on model kits, but they’re never used for airbrushing. Example oil brands: Windsor & Newton, Gamblin. If you must use a different paint type on top of another that can be affected by thinner, be sure to use a protective gloss topcoat before doing your next layer as this will help protect the bottom coat as well as prevent the thinner from damaging the paint job below. The best recommended order for layering paints is as follows: Plastic part > Primer > Lacquer > Enamel > Acrylic. This is to prevent the thinner from eating away from the other paint types. Never paint lacquer on top of acrylic based paint without 1-2 layers of protective finish. The lacquer paint will melt off the acrylic paint and can even damage the plastic underneath. If you are airbrushing with multiple paint types, make sure you clean between each color even more thoroughly than normal. This will help protect your airbrush nozzle and remove any possible paint reactions that may occur inside the tip. Always make sure when your painting you have plenty of ventilation and air to breath. Paint fumes can be dangerous if you have not prepared your area. Make sure you use the proper thinner for each paint type. Mixing thinners can cause undesired effects. I recommend using the same brand paint thinner with your paints. Example: use Tamiya paint thinner with Tamiya paints. These thinners are specifically made for these paints and will have the best results. Lacquer thinner can thin all types of paint, while enamel thinner can thin both enamels and acrylics, and acrylic thinner can only thin acrylics. However, I would only use the proper thinner with each paint. Then, when I’m done painting, I use cheap lacquer thinner to clean all my parts after using them. I hope this sheds some light on the different kinds of paint there are out there, and helps you choose what to use for your next model painting project!